"The Homes of Thoughtful Service"
Be the first to share your favorite memory, photo or story of Harry. This memorial page is dedicated for family, friends and future generations to celebrate the life of their loved one. 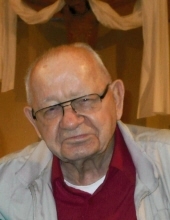 Harry Switch, 94, of Welch WV, passed away Friday, February 8, 2019 at Westwood Rehabilitation Center, Bluefield VA. Born September 26, 1924 in Eckman WV, he was the son of the late Paul and Mary Tydaschuk Switch. In addition to his parents, he was preceded in death by, one daughter, Sharon Blackburn, sisters, Anne Beront, Ethel Dillon, Julia Herring, Stella Lambert, brothers, Frank Perfin, Lee Switch, John Switch, Mike Switch, Steve Switch, Paul Switch. He was the last surviving member of his immediate family. Survivors include, his loving wife of 69 years Anna Hornick Switch, of the home, three daughters, Mary C. Cook and husband Carl of Narrows VA, Barbara Baker and husband Sam of Princeton WV, Judy Inscore and husband Jackie of Clayton N.C., one son in law, W. Douglas Blackburn Jr of Richmond VA., six grandchildren, W.D. Blackburn III, Kelly Charles, Denise Carvalho, William Larry Lockhart Jr, Benjamin Baker and Madalyn Grose, great grandchildren, Victoria, Brittany Hannah, Maksim, Abigail, Mateus, and Baker; and a host of nieces and nephews. Our Family would like to thank his special caregivers that loved him dearly, Wilma Johnston and Paula Burnoski. A Mass of Christian Burial will be held Tuesday, February 12, 2019 at 12:00 P.M. from the Sacred Heart Catholic Church in Princeton, with Father Greg Lyttle celebrant. Friends may call from 11:00 A.M. till 12:00 P.M. Tuesday, February 12, 2019 at Sacred Heart Catholic Church in Princeton WV. Entombment will follow at Woodlawn Memorial Park Mausoleum in Bluewell WV; where Military Grave Side Rights will be conducted by V.F.W. Post 1144 of Iaeger, WV. Ben Baker, W. Larry Lockhart, Doug Blackburn III, Sam Baker, Jackie Inscore, Garin Grose, Stanley Roberts, Benito Aguirre, will serve as pallbearers; Honorary Pallbearers will be Carl Cook. In lieu of flowers, the family would like Memorial Contributions made to McDowell Visitors and Veterans Center, P.O. Box 303 Kimball, WV 24853, or McDowell County Animal Shelter 109 Dog bone Dr, Superior, WV 24801. Fanning Funeral Home of Welch is serving the Switch Family. To send flowers or a remembrance gift to the family of Harry Switch, please visit our Tribute Store. "Email Address" would like to share the life celebration of Harry Switch. Click on the "link" to go to share a favorite memory or leave a condolence message for the family.